Center Long Panel INSIDE slats, along back of crib, as shown. In each corner (I and II), weave ends of Long Panel BEHIND the crib slats (a, b, c and d) so that liner passes in front of back corner posts. Pull each end of Long Panel along slats inside the crib, toward the front corner posts (III and IV), as shown. Take end of Long Panel and wrap it behind 1st crib slat next to front corner post (III). 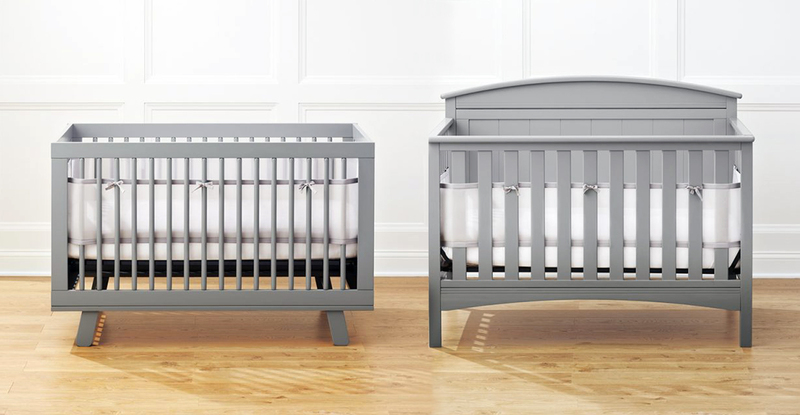 Since crib slats vary in position and width, you may need to choose a different slat instead if it feels too loose or there seems to be extra material. 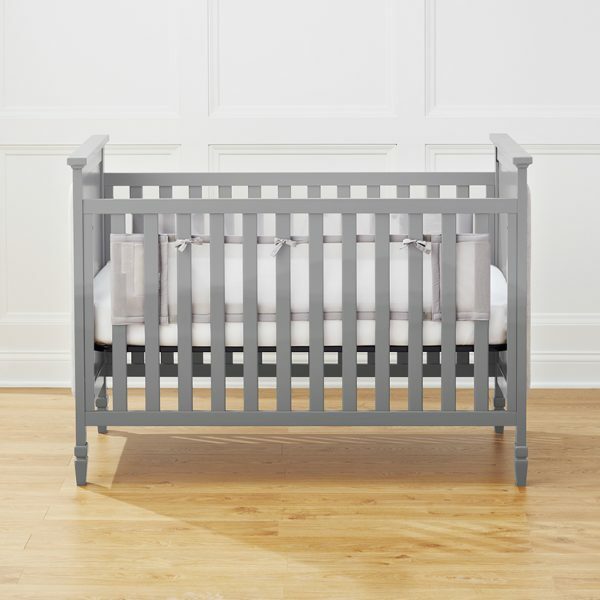 Secure around crib slat by pressing together top & bottom edges of Long Panel. Make sure there is a snug fit to prevent any sagging. Repeat for other side (front corner post IV). Tuck bottom edge of Long Panel below mattress. Center ties as best as possible on outside back of crib, knowing that crib slats may vary in position and width. Tightly tie all 3 ties OUTSIDE crib slats. Make sure Long Panel stands up, pulling taut to tighten if it sags. It should not sag down. Center Short Panel INSIDE slats, along front of crib, as shown. In each corner (III and IV), weave ends of Short Panel BEHIND the crib slats (e, f, g and h) so that Short Panel passes in front of front corner posts. Take end of Short Panel and wrap it behind 2nd crib slat next to front corner post (III). It will sit in front of the Long Panel. Since crib slats may vary in position and width, you may need to choose a dierent slat instead if it feels too loose or there seems to be extra material. 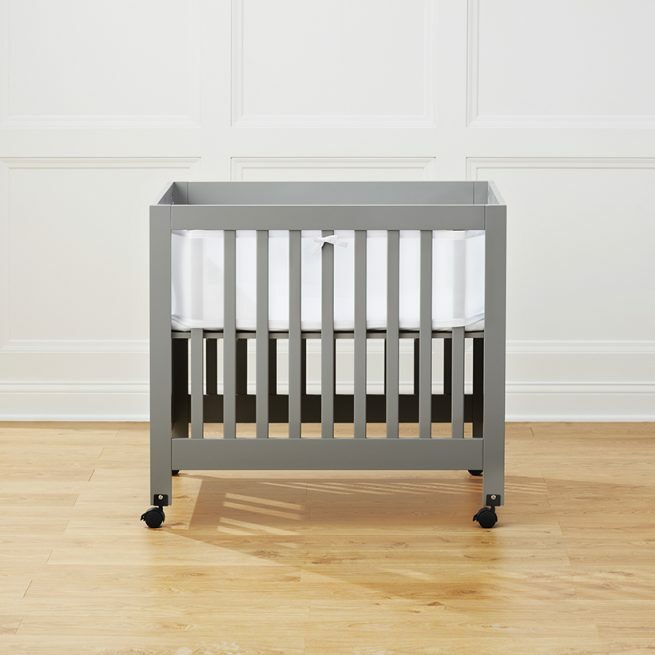 Secure around crib slat by pressing together top & bottom edges of Short Panel. Make sure there is a snug fit to prevent any sagging. Tuck bottom edge of Short Panel below mattress. Center ties as best as possible on outside front of crib, knowing that crib slats may vary in position and width. Make sure Short Panel stands up, pulling taut to tighten if it sags. It should not sag down. Follow Figure 2 and Figure 3 for weaving through slats and attaching ends of Long Panel to outside of crib. Because back of crib is solid, back corner posts will be uncovered by mesh.